Bring some sparkle to your service with these WNA Comet 610155 Reflections 7" stainless steel look plastic forks! Combining the sleek look of stainless with the convenience of disposability, these heavy weight forks are just what you need to add some pizzazz to otherwise casual catered affairs. Use them at wedding receptions, retirement parties, anniversary occasions, and so much more! Their stunning appearance is sure to be a showstopper during virtually any course from appetizers to desserts. When used alongside upscale disposable plastic plates, cups, and bowls, these Reflections forks fit right in for fast, efficient service. These look great and the finish is slightly nicer than the Silver Visions brand,with fewer imperfections, but I don't think either brand should be considered "heavy weight." I think the tines are SLIGHTLY stronger on this brand. The two brands are almost identical otherwise. Thanks for your review! These forks are considered "heavy weight" because in comparison to the average plastic fork, they are more durable and rigid. 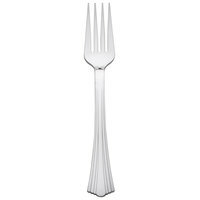 When compared to metal forks, these will generally feel "light" but the "heavy weight" comes from the comparison with the average plastic fork. They are meant to resemble a stainless steel fork more than the average plastic fork. Bought to use for my wedding. They are good quality utensils and will fit in with my decor. Will order again for next big event. This durable disposable fork is an amazing product for any event. It looks beautiful as part of a table setting, yet is extremely convenient for cleanup. Best of all, it is very sturdy. Great product! Highly recommend this item. Ordered for a clients wedding and the couple just loved them. The guest went wild when they saw they were plastic. Highly recommend Reflections Stainless Steel Look Heavy Weight Plastic Forks. I need a large number and ordering in bulk for this price is defintely a great buy. Purchased these for my daughter's wedding. I was debating whether to purchase the shiny silver or the sterling - glad I selected the sterling. The look is great. Just wish they were a tad bit sturdier. I only purchase my reflection silverware from Webstaurantstore.com. They have the best price. These will dress up any catering event that you may have. A must have for any business. Silver forks that look like real silverware. These were the listed here for the best price online and worked out perfect for our off premise event we catered. I highly recommend this fork to all. Every one thinks this fork is real and is amazed to find out that it is a disposable item. The Reflections Heavy Weight Stainless Utensils are a wonderfully beautiful disposable option! I would suggest, and have, these to be ordered by others. I will be ordering again! i really like this fork and i also use this in my facility. my customer never complaint this look too cheap. they look really dissent. I love these WNA reflection ware so much! They look a lot like a regular metal fork and I have received a lot of compliments on these. This reflection ware will add that elegant look you are seeking for any medium priced banquet! They look way better than standard plastic forks and they always fool the guests! These forks will do the job. Not thrilled with them. High price for a silverware that doesn't really set it apart from any other brand. The reason it has a higher cost is because it is more durable than an average plastic fork and is meant to resemble flatware that is actually made from stainless steel. We have received much positive feedback from customers about this fork but if a lower weight plastic fork is what you prefer, we carry those too like the Medium Weight White Plastic Fork 1000 / CS. If you have any questions, please do not hesitate to contact us! we cannot wait to use these...they look great and look very real. we are using these for our daughters wedding in october and will post pictures after. These work awesome for big events. They are a cheap buy without the cheap look. Easy cleanup and extremely sturdy. I use them in my own house. These are a really awesome idea. Absolutely great for catering events! You can save so much money by getting these heavy duty stainless steel look a likes! I use this cutlery as my standard in catering functions. Clients feel that they are getting a nicer piece of cutlery and they are excellent value! I have used the Reflections Stainless Steel look forks and knives for two weddings, a 65th Anniversary party and a tea. Everyone is so surprised that they are plastic !! I love them. We used these at a large wedding reception and they looked like the real deal. Saved loads of time with cleanup and everyone made comments about that was the way to go! A very beautiful,impressive, inexpensive, and sanitary alternative to real silverware! They look fantastic! I've received many positive comments on these! I'm often asked where I got them. I still have some of the forks left over and I use them when I have guests. Nobody knows they are not the real thing! Love the weightlessness of it. We love these forks. They look absolutly marvelous on the tables. It is always entertaining to hear the guest's comments about the use of "real silverware" & then say wow they are plastic...so beautiful. Sturdy too! I bought these for my wedding and they are perfect! They are very durable and look like real silverware! I also bought the spoons and knifes. Great buy! Thank you! Loved the product, Very nice and elegant, just what I was looking for. Looks like the real deal. Very impressed. Receieved items in a timely manner. I love these utensils. Every time we use them, our guests are surprised that they are disposable. This was our second year to "upgrade" from packaged forks with napkins and pepper packets and our guests were so happy with the results. These are so real looking, no one wants to throw them away. the perfect upscale look for a disposable occasion. heavy duty. forks and knives stand up to cutting meat. Guest keep asking me why they should dispose off this forks, they look and feel like the real thing and durable at the same time. For the price, i can have it disposed off and keep buying. Good quality for the price. THESE ARE A GREAT PRODUCT! I WOULD HIGHLY RECOMMEND FOR ANY OCCASION FROM GRADUATION TO WEDDINGS. MOST GUESTS COMMENT RIGHT AWAY ABOUT HOW THEY THINK THEY ARE THE REAL THING! We have used these for wedding reception and showers with raves from the guest thinking they are real. Most are reluctant to throw in the trash. Great product and preparing to reorder. I wanted to find stainless steel flatware without having the hassle of where to store them once the party was over and found these instead! Who knew you could get the look of stainless steel with the ease of disposability....absolutely FABULOUS! These were a hit at my event....I will be ordering MORE! I love this silverware. I have used it at 2 of our daughters weddings and ordered it for our next daughter's wedding. I has the elegance of the real thing but no clean up. The price was also great. Amazing! I have ordered these forks many times over and will continue coming here to order these for future events. Everyone is shocked when they pick the fork up and realize it's plastic. The looks on their faces are priceless! This plastic silverware looks real, not plastic. It has a good weight, and shines beautifully. It definitely dresses up a table, and helped make my daughter's wedding beautiful. These are much sturdier than normal plastic forks. They also look exactly like silverware. You would notice the difference while eating with them only because of the weight and temperature. They look just like the real thing!! Love them!! They will look great on the tables at my wedding. Looking forward to using them soon! Every time we cater an event using the Reflections Stainless Steel Plastic Flatware, the guests "ooh and ahh" over the look and feel of them. Because they are so reasonably priced, I frequently "upgrade" my kosher and casual clients with Reflections flatware and they are so happy with them and me! Excellent. Perfect for any classy event! Clients love it. Looks very real, and saves a lot of money on washing and clearing for the hostess of any party. We used the WNA comet Line for my mom's 67th birthday party. Needless to say many were convinced they were dining on fine china until they began to handle the forks & knives. The plates are so elegant and durable that they can actually be reused. Have fun at your next dinner party and treat your guest like royalty...you deserve the break from washing dishes.